Most gold in South Carolina is found within the Carolina Slate Belt, which runs across the state, parallel to the Atlantic Ocean roughly 125 miles inland. This gold bearing region actually starts in southern Virginia and extends south to parts of Georgia, including both Carolinas. In South Carolina, the belt starts at Lancaster County to the north, and travels southwest toward Edgefield County. Lancaster County contains one of the largest mines in the southeast, the Haile Mine. It is a lode mine that has produced over ¼ million ounces of gold. Numerous other gold mines are scattered throughout the county, and all creeks near these mines are likely to contain placer gold. To the west, York County is also a good gold producer, with dozens of lode mines throughout the area. Many of the creeks and rivers in the area will hold placer gold. Check the Broad River and its tributaries, as well as the Little River in nearby Fairfield County. Cherokee County is another area that has produced lots of gold over the years. Chesterfield County has had extensive gold mining since the early 1800’s. For placer mining, based on the name, Nugget Creek might be a good place to start prospecting. Saluda County lies within the Carolina Slate Belt, and has several gold mines and placer locations. Check the Little Saluda River and its tributaries. Edgefield County has a few productive lode mines near its border with Georgia. Numerous other counties have potential for producing gold. As stated earlier, focus your efforts within the Carolina Slate Belt, as this is the area that contains the vast majority of productive gold mines throughout the state. Most commercial efforts here have been hard rock developments, but placer gold can be recovered by panning and sluicing. It has been stated many times, but beginning your search where gold has been found before and you will increase your chances of success. 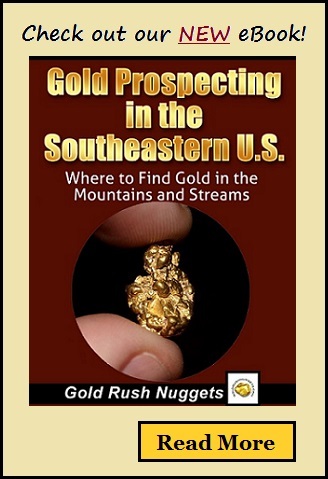 Want more information about gold prospecting in South Carolina?